My mother makes this wonderful curry. It was one of the dishes on the menu of my 18th birthday party lunch, lovingly cooked by my mother for all my college friends. She also serves this curry many a time for get togethers. If you want something that stimulates appetite and tingles the taste buds this could be the curry you are looking for. The spices used add their characteristic aroma and also have digestive properties. Served with plain rice, it surely falls into the category of comfort food for me. 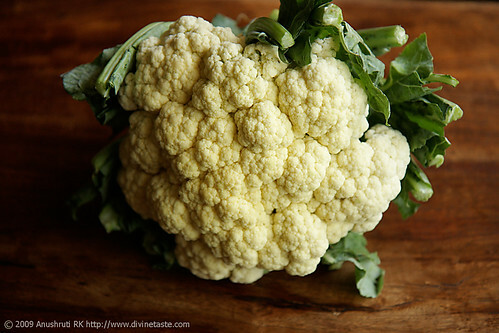 Cauliflower is a great vegetable and the numerous things a cook can do with it are phenomenal. This curry is just one example. There are so many other cauliflower delicacies that are yet to be cooked and featured here. Right now, cauliflower is taboo as I am on a postnatal diet. This excludes me from eating cauliflower in any form for a few months. This also means I cannot eat this tasty curry in the near future. But I do hope you enjoy this curry from my mother’s recipe basket. Serve this curry with plain basmati rice, peas pulao or rotis. Clean and wash the cauliflower, cut into florettes and steam them until tender. 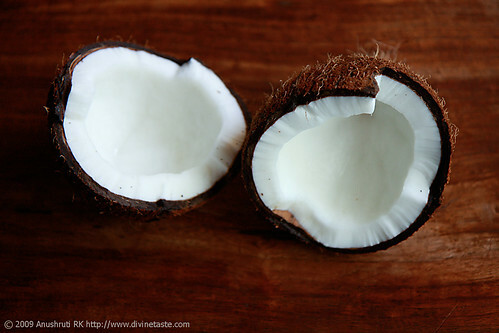 Grind the ingredients to be ground into a fine paste using the water with the help of a food processor or blender. In a medium sized wok or kadhai, heat the ghee or vegetable oil over a low flame. While the fat heats up, put inthe cloves, cardamom pods, cinnamon and peppercorns and crush lightly in a mortar and pestle. This will help to release more flavours. Add in the cumin seeds and the crushed spices into the oil or ghee and stir gently for a couple of minutes until they turn aromatic. Stir in the ground paste and fry for 3 to 4 minutes until the raw smell disappears. Add the cooked cauliflower pieces, pour in the water and bring the entire mixture to a boil. This should take another 3 to 4 minutes. Put in the salt and limejuice and turn off the heat. Serve hot. Never thought of adding limejuice in a cauliflower cuury. Will have to try. Seems like a great recipe, will have to give this recipe ago as my husband loves cauliflower. I religiously take a peek at your lovely website everyday and ask my MA to try out the new receipes. Have been doing it for 2days now and i dont see a new update ;-(. I guess motherhood is keeping you busy and we will have to wait for sometime till we see a new post. Take care. But i am eargerly waiting for new recipes, and recipes and more ;-). 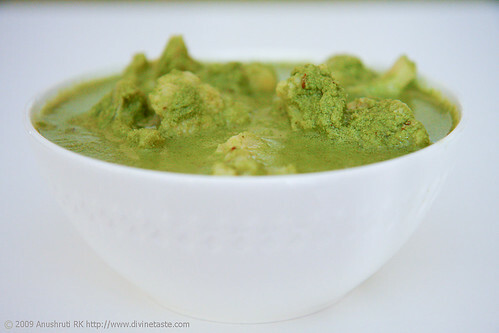 Hi, I am so thankful to you for sharing green curry recipe. I am a vegetarian. Hope that I can try out the recipe in the very near future. Good post! Bee: You will enjoy this recipe…vegetarian or not. Anu, I made this and totally enjoyed eating it! The cauliflowers soaked in the curry are so juicy and flavourful. just yum! I also wanted to ask you which oil (cocnut, peanut, refined, etc) do you recommend using for Indian curries like this? Sorry for the delay in replying to this Ashwini. Somehow missed it. 🙁 I would recommend using oils like peanut, sunflower, safflower or rice bran which are neutral and without any strong flavour. Olive oil in Indian cooking which seems to be catching up is a strict no-no in my dictionary as it overpowers the flavour of delicate spices used in Indian cooking. This sounds wonderful and I'm eager to try it! Finally got a chance to try this recipe tonight, and it was a big hit at the table. Thanks for sharing your ideas and love of good food. We love your videos! Michael- Awesome! Glad you liked it! Why no cauliflower postnatal? Sorry I have no idea. Prajakta- It's difficult to digest.